In two days’ time the Olympic Games will draw to a close – and what a thrilling spectacle we have witnessed these past two weeks! Whether it was Simone Biles on the gymnastics floor or Michael Phelps in the swimming pool, we have been enthralled by their performances and inspired by their infectious enthusiasm. The founder of the modern Games, Baron Pierre de Coubertin would have been delighted at the camaraderie seen during the XXXIst Olympiad held in Rio de Janeiro. The highlight for South Africans occurred in the early hours of Monday morning – when many of us were asleep! – during the final of the 400 metres for men. 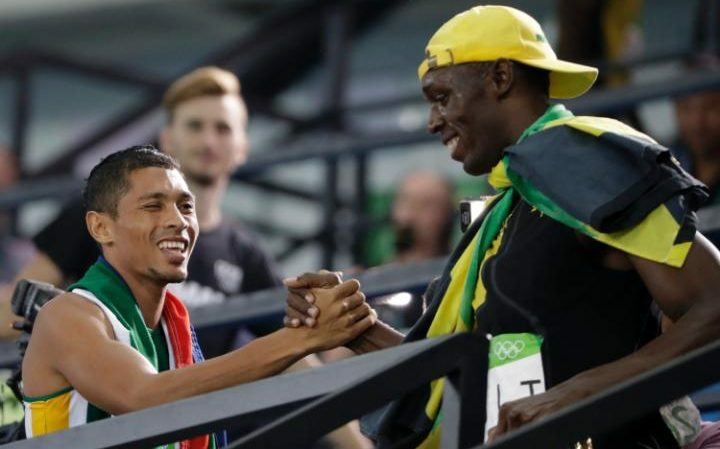 Running blind in lane eight, 24-year-old Wayde van Niekerk produced the performance of his life, and some would argue it was the standout performance of these Games, to win the gold medal in a remarkable world record time of 43.03 seconds. Not only did he smash the record set by the inimitable Michael Johnson in 1999, his achievement prompted Usain Bolt – shortly after winning his own gold medal in the 100 metres race – to seek out and congratulate the young South African (seen left). Now that surely is what the Olympic spirit is all about! Amid all the excitement of these Games, there have also been a few terrible injuries sustained by the participants. One of these was suffered by the 72kg Armenian weightlifter Andranik Karapetyan who, when attempting a clean-and-jerk lift of 195kg severely dislocated his left elbow. Another unfortunate competitor was the French gymnast Samir Saïd who sustained a double break of his tibia and fibula when he missed his landing during the vault. Fortunately the Olympic polyclinic, under the leadership of chief medical officer Dr João Grangeiro, has a well-equipped imaging facility with two MRI systems, four ultrasound machines and three X-ray units. 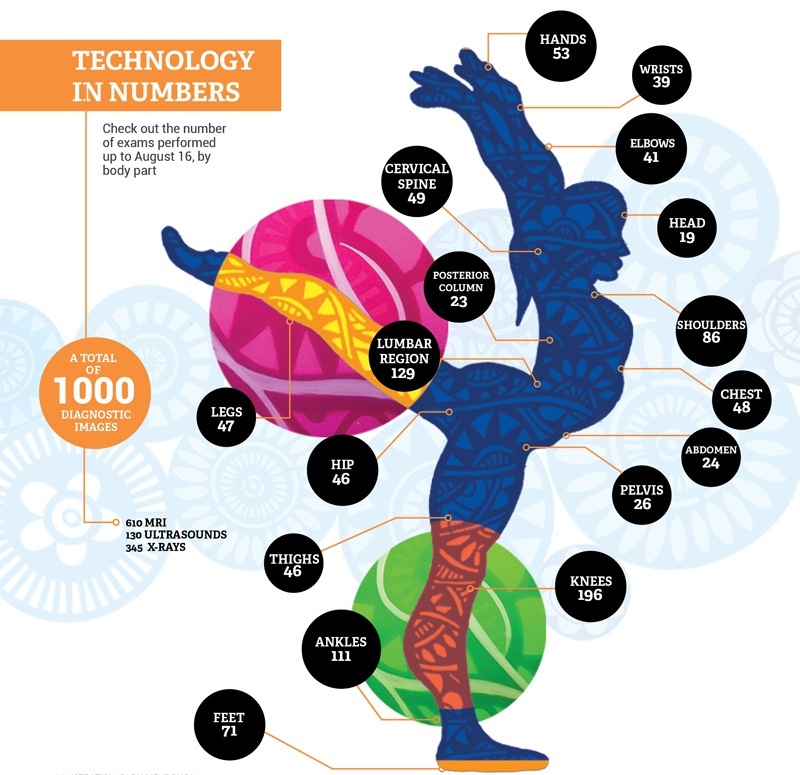 Donated by GE Healthcare, the equipment has already been used for more than 1,000 imaging examinations, and GE has produced a picture that illustrates the numbers by anatomical region (click on image at right). Perhaps unsurprisingly, it’s the knee joint that has received the greatest attention. In aiming for the Olympic motto of citius, altius, fortius – faster, higher, stronger – a few of the athletes have sadly been injured. Most will leave stronger, both mentally and physically, while an elite few like Simone Biles, Michael Phelps, Usain Bolt and Wayde van Niekerk have left a lasting impression on all those who witnessed their astonishing performances. Well done, Kit, on including the Ollies with a medical slant, where we witnessed some astounding performances. And let us not forget the time spent on perfecting routines.